Yes. See our warranty page. Does CMS provide maintenance services? We will not provide maintenance services for new customers, only looking for maintenance. 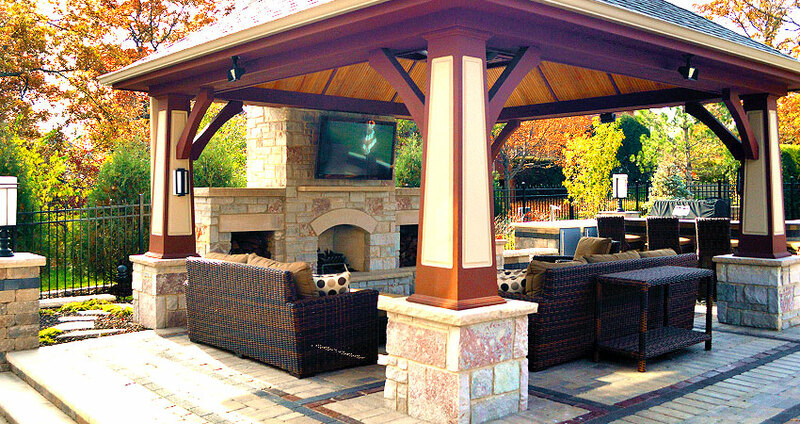 We will provide specific maintenance services for existing customers that are looking to maintaining design installations they we have created for them. We do not do any type of lawn maintenance. What time of year is best for planting? Early spring and late fall are best. Fall does have a slight advantage because it gives the plant two full seasons of growth before they have to endure a hot summer. Where do you purchase your plants? We purchase our plants from local nurseries and each purchase varies based on plant availability. We install high quality plants that are locally grown. Plants that are locally grown are acclimated to our climate and soil type. How often should I water my new plants? If your plants have been installed in early spring and late fall, they should be watered the first day of planting and then every 5 to 6 days. If your plants have been installed in mid spring and early fall, they should be watered the first day of planting and then every 3 to 4 days for the first three weeks. For plants installed in mid spring continue water throughout the summer months on an as needed base. You can check to see the moister level in the ground near plants by moving the much aside and checking the soil with a garden spade about three inches down. If the soil is dry, increase the watering. If your plants are installed in the summer and early fall months; new plants should be watered every day for the first week after planting, every two days during the second week and every three days during the third week. After that, every 4 to 5 days is sufficient depending on extreme heat, wind conditions and, of course, rainfalls. It is always best to apply water directly at the base of each plant. Do this for approximately three to five minutes for each shrub and 10 to 15 minutes for trees. Perennials will only need about one minute each. Rest the hose 5-10 inches on the high side if there is a slope. If you are not able to water plants individually and you use a sprinkler to water, then remember to water heavy less frequently so the water has a chance to get down into the ground. If you are using a sprinkler to water check the soil in multiple areas on a regular basis to make sure it is not drying out. How do I care for seed and sod? Watering? Mowing? First of all, do not allow the sod to dry out, it will shrink and leave seams. On THE DAY that that the sod is installed, the first watering needs to be extremely heavy, making the sod soggy and puddling has occurred. For sod that has been laid in cool weather, water every 2 to 3 days depending on rainfall. For sod that has been laid in hot, dry weather, water it every day for the first two weeks. The sod should be soggy to the touch. After that, reduce watering to every other day for 2 to 3 weeks. The ground should be soft. After 4 to 5 weeks, water the sod once a week if there has been no rainfall. The best time to water is early morning or early evening. Avoid walking on sod after watering as much as possible, you will leave impressions. When the sod is about 3" high, check for knitting. Knitting is when the sod’s roots take hold to the ground below. You can check for this by gently pulling up a corner of sod. If you cannot pull it up, it has knit. Now it’s time to mow your lawn. Do not water for a few days before mowing and set your mower blade at a high setting. Seeded areas should be watered two times per day in hot weather and once per day in cool weather. Keep the seeded areas moist and do not allow to dry out. Be cautious not to over-water your lawn (large puddles in the lawn,) or under-water (dried out or cracking). You can mow your lawn around 4 to 5 weeks after germination. Water early in the morning to help your new grass endure the day’s heat. Do not fertilize until the following spring or fall and never over fertilize. 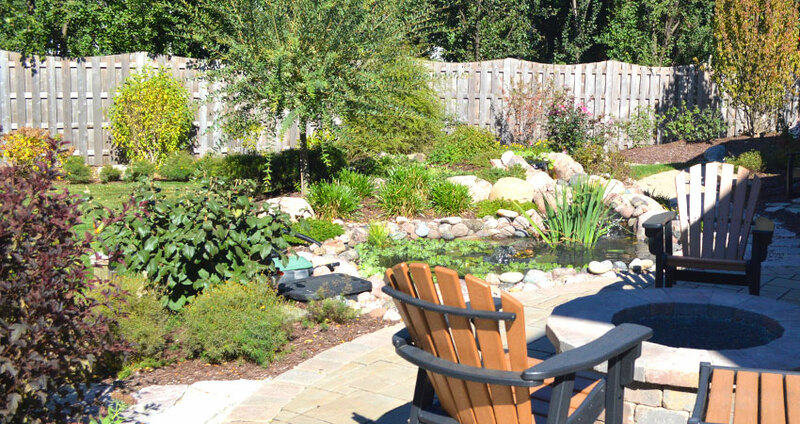 Are water features difficult to maintain? No, actually they are very easy to maintain due to the new filtration systems, plants rocks, fish and beneficial bacteria. All that is required is one annual spring clean-up. This can be a do-it-yourself project or CMS can provide this service for you. 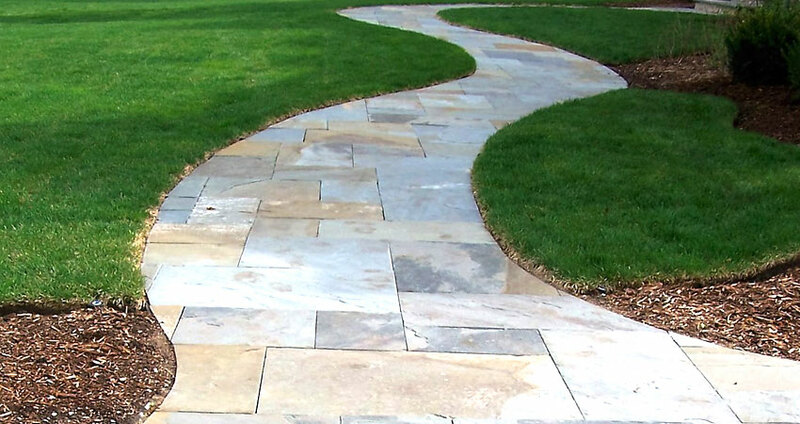 What are the advantages of paver patios and walks over concrete? 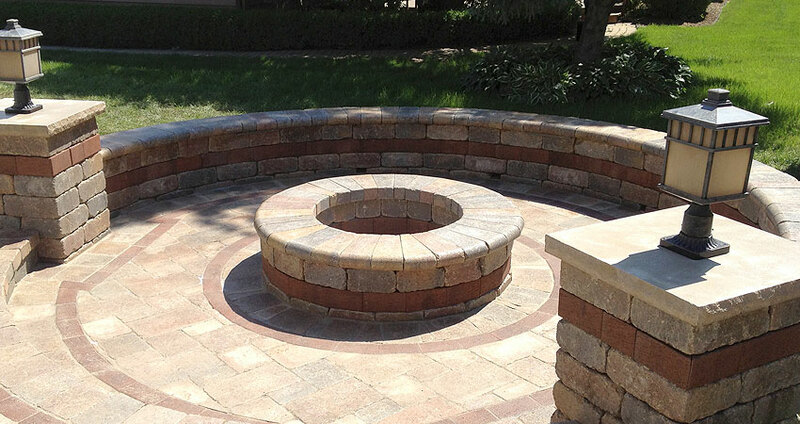 Although the initial cost of pavers is slightly higher than concrete, it is far outweighed by the long term advantages. Concrete is prone to cracking at any time (especially with our Chicago winters). If a concrete patio cracks or has been stained by oil, all or a large portion of that patio will need to be torn out and replaced. If one or a few pavers crack or are stained, all that needs to be taken out and replaced are those pavers. 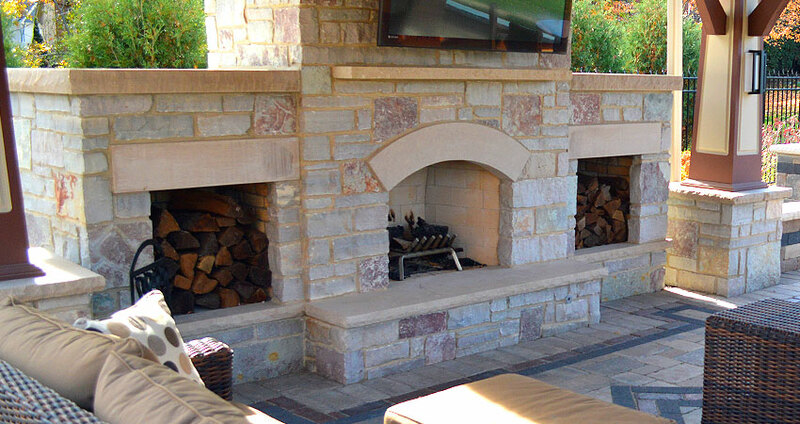 Pavers are more resistant to cracking due to their higher density (PSI rating). Concrete is also prone to pieces cracking off at the surface and forming large divots. How do I care for my pavers in the winter? 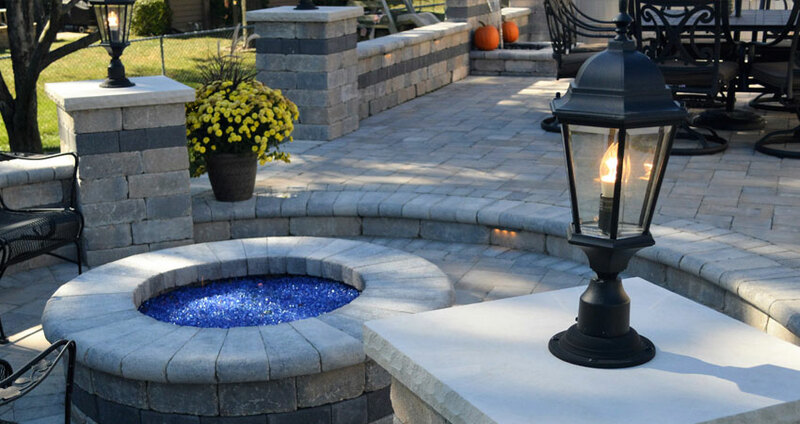 To care for your new pavers in the winter, the manufacturer recommends using a rubber-edged shovel to avoid leaving any scratch marks on your new pavers. If you prefer to use a snow blower, make sure you can raise the setting on any metal parts that may scrape the pavers. (This can also apply to natural stone, such as bluestone). Should you wish to de-ice your new pavers, you should buy a de-icing product that does not contain ammonium.